In his epic commencement speech to the USC law school grads in 1994, Charlie Munger mentions “scale” 24 times. The advantages of scale are “ungodly important”, he points out. Benefits of scale include reducing costs, raising prices and testing new markets. Boy, I love John Hagel — This guy is a walking web site. I’m amazed his thoughts on “shaping’” have not become more famous! Afterall, how many of you wouldn’t like to create the next Google, Facebook, Microsoft or Visa type of ecosystem? 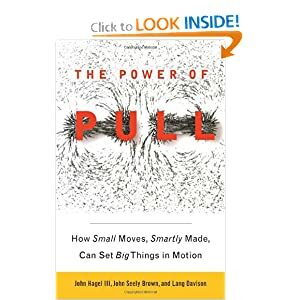 He covers “shaping” and other concepts in his book The Power Of Pull. I got a chance to meet Mr. Hagel when I sat in on his latest “shaping” presentation at South by Southwest (SXSW) this week.